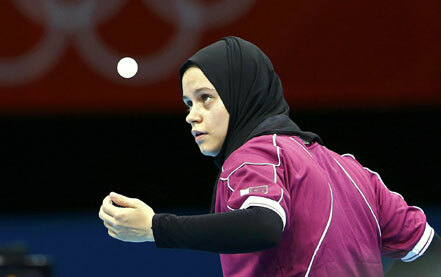 February 24 - Qatari swimmer Nada Arkaji and table tennis player Aya Majdi, who both made history by competing at the London 2012 Olympic Games, have given their full support to the country's recent National Sport Day. Arkaji (pictured top) and Majdi made history as they were two of the four women to represent Qatar at the Olympic Games for the first time ever at London 2012; along with sprinter Noor Al-Malki and shooter Bahiya Al-Hamad. The two teenagers are now aiming for the Rio 2016 Olympics and have used their new celebrity status to publically back Qatar's National Sport Day. The National Sports Day is an annual sport event in Qatar held on Tuesday in the second week of February after it was created by Deputy Emir and Heir Apparent HH Sheikh Tamim bin Hamad Al Thani to encourage people across the country to participate in sport. This year, it was held on February 12 and it saw hundreds of people across Qatar take part in a variety of different sporting activities. "The National Sport Day creates awareness of the importance of a healthy life," said Arkaji. "From my side I am encouraging people, especially girls to join swimming or any other sport, to feel the joyful atmosphere of a sporting community. "Through sports I managed to enhance my confidence, to build a strong personality." "Don't waste your time, wear a track suit and start practicing now, no matter the sport. "Even walking can make you mentally and physically healthier." Majdi was equally full of praise for National Sports Day. "This initiative guides people to follow sports and encourages families to let their daughters join sports," she said. "My life has changed completely. "I have been healthy and active; I met other people from various places. "I train almost every day and I have realised that sports helped me in studying as well. "Be active and join any kind of sporting activities. "You will become healthier and you will have fun."